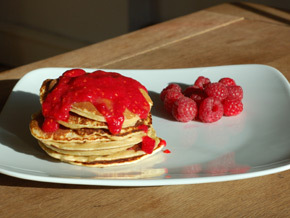 These pancakes don't taste much different to their higher glycemic index version and provide a substantial balanced meal to start your day. Sive the dry ingredients into a mixing bowl. 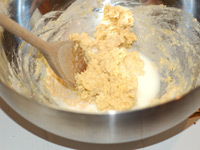 If preparing the mixture in advance then leave out the baking powder and add it just before cooking. Add the egg whites one at a time separating by allowing it to fall whilst passing the yoke between the shell halves. Mix the eggs and flour together then add a third of the milk. Mix that in well before adding another third and mixing further. Finally add the remaining milk and the vanilla extract and mix to a smooth paste. 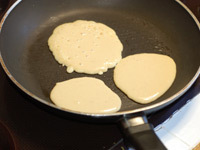 Spray a frying pan with a thin layer of olive oil and spoon small amounts of the mixture into the pan to form pancakes. Cook for about 30 seconds on each side or until brown. You can prepare the mixture the night before and store it in the fridge.